MBS Day Ahead: Fed Day, Bounce Day? 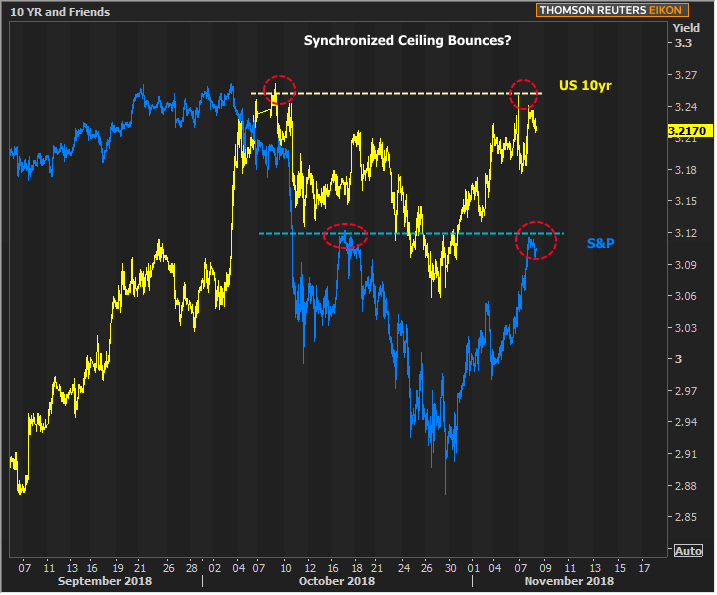 I’m going to talk about the potential for a friendly bounce in bonds today. I want to be clear right up front that I’m presenting this as one of two possibilities, and without any comment on which possibility is more likely. It’s just that we’ve sort of beating the “rates are going higher” thing to death–at least for the time being. The possibility, threat, or perhaps even likelihood that rates can, will, or should go higher isn’t going anywhere. It’s something that should be part of your survival strategy for however many more months it continues to be the case (yes, I think we can count it’s remaining lifespan in months, not years). Our most recent trend toward higher rates has coincided with a bounce in stocks. Going back a few weeks before that, our most recent rally was also driven by stocks. That’s not to say that bonds will always follow stocks, just that they have in October and early Nov. The only exception was the 2 trading days following the NFP report, which hurt both stocks and bonds. It continues to be the case that a bigger stock-driven rally in bonds would require much bigger stock losses than we saw in October. At this point in the economic cycle, such a stock sell-off would be fairly brief, most likely, but not impossible. The other option is that stocks could begin consolidating in a relatively sideways trend ahead of their next big move. When they did this in 2015, they didn’t break their previous highs again for more than a year. That ended up being a great 12 months for bonds. For now though, the earliest indication–the one that would keep hope alive for a stall in stocks, would be a ceiling bounce around current levels. That would coincide with a ceiling bounce in rates. Even if stocks break the ceiling in the chart, there would be another potential ceiling at September’s highs. But due to bonds’ underperformance, that would be more likely to coincide with an upwardly sloped ceiling line for bonds. In other words, we’d be looking at something closer to 3.30-3.35% if stocks manage to recover that much (assuming, of course, that bonds continue to take cues from stocks). The Fed says every meeting is a “live meeting” where they could make changes, but they’ve consistently shied away from doing so at these off-the-run meetings.